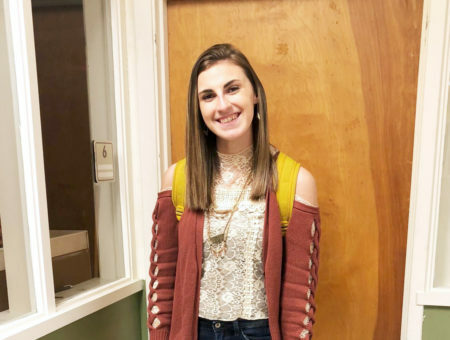 Hendrix College street style is spotlighted. Check out Ann Marie’s cool layered look and learn how she styles a denim mini on campus. Finals week is no fashion show. 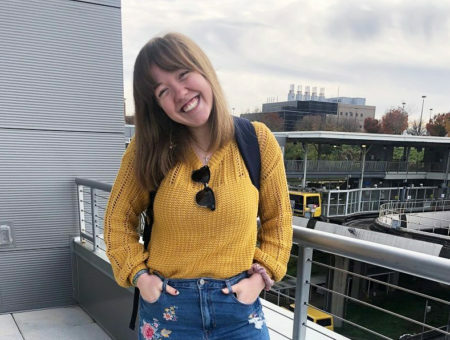 Most students strive for cram-session-friendly ensembles during the final days of the semester, but I spotted Ann Marie looking put-together and polished – a fashion diamond in the rough amidst the finals week sea of sweatpants and wrinkled t-shirts. Her layered look is not only adorable but also perfect for the fluctuating Arkansas winter weather. Ann Marie was on a mission to create an outfit around this button-up blouse, a bargain she scored at Walmart. 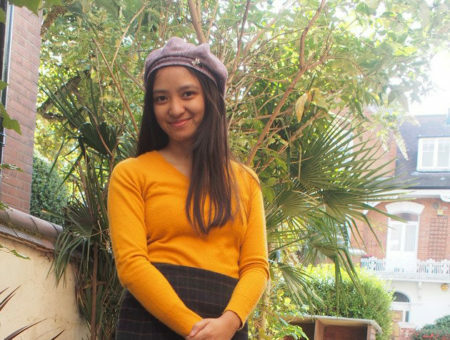 White button-ups may sometimes seem a bit business-like and boring, but when tucked into a colorful skirt or layered under a cardigan and paired with pretty accessories, this classic piece can be a versatile addition to outfits for different seasons and occasions. 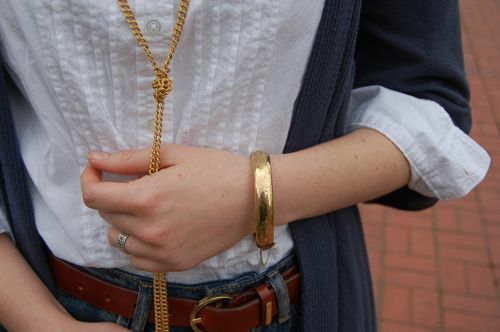 Ann Marie’s knotted necklace and gold bangle are hand-me-downs from her mom. Reusing family members’ jewelry can be an inexpensive and meaningful way to add class and interest to any outfit. Ann Marie’s belt (by Calvin Klein) and gold accessories break up the neutral white and navy skirt, adding a touch of shine. Ann Marie’s cowboy boots really make her outfit pop. The contrasting grey tights and tan boots are an unexpected combination, and Ann Marie’s retro jewelry, simple layers, and jean skirt bring the whole look together into an adorable outfit with unique touches. What do you think of Ann Marie’s look? 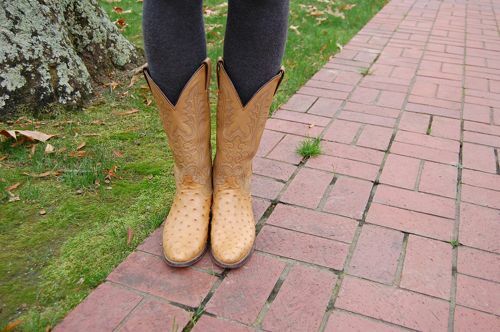 Have you added cowboy boots to your shoe collection yet? Do you emulate a family member’s style? Let us know with a comment!